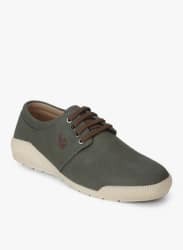 Showcasing a striking low-ankle silhouette with round toes, these olive coloured lifestyle shoes by Flying Machine will complement all shades of chinos and jeans. Featuring lightweight synthetic upper, these lace-ups for men promise exceptional comfort for your feet. The rubber outsole guarantees the better flexibility and durability. Shoe Care Surface Dirt can be cleaned with a good quality brush or a damp cloth.